Bear Lodge. Bear’s Tipi. Tree Rock, Grey Butte. Aloft on a Rock. Bear’s House. Bear’s Lair. Home of the Bears. Mythic-owl Mountain. Ghost Mountian. 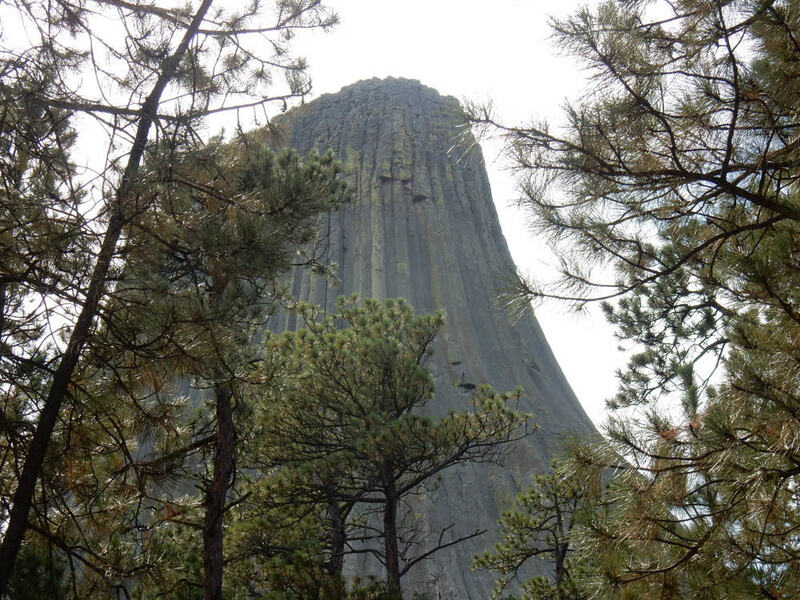 Over 27 native tribes designate the Devils Tower as spiritual and religious location, for over 900 years. 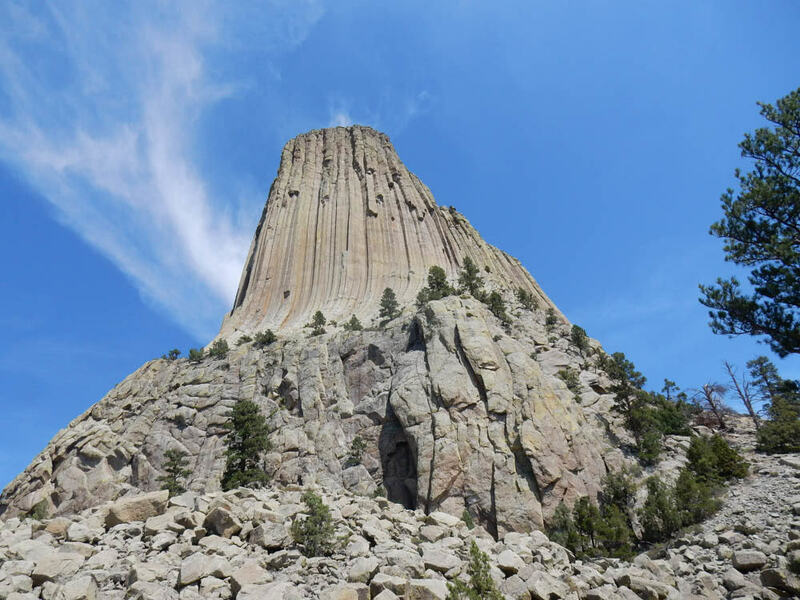 The name Devils Tower didn’t take until Col. Richard Irving Dodge’s interpreter miss understood the name as “Bad God’s Tower,” which then morphed into today’s Devils Tower. 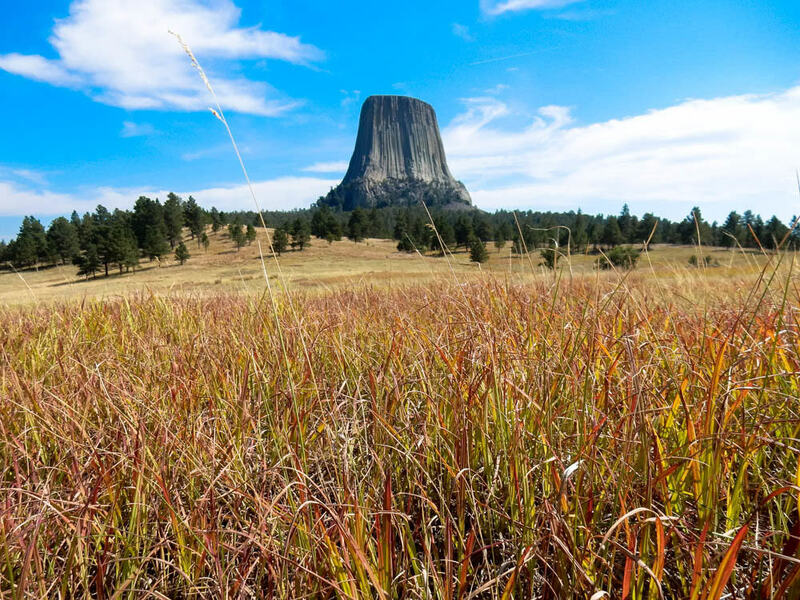 Somewhere in history, the apostrophe got dropped just before its declaration as Devils Tower National Monument in 1906, which recently celebrated its US Monument status earlier this month on September 24. 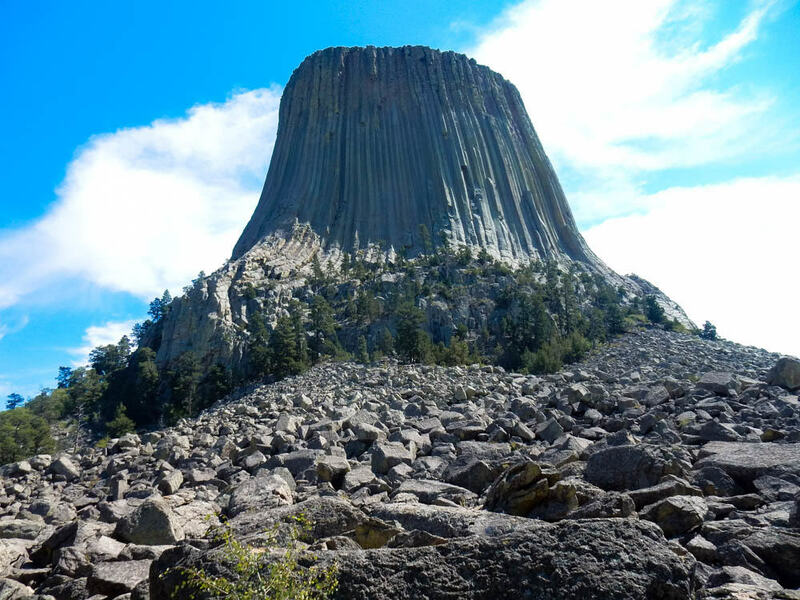 The native tribes and even a few interfaith groups, find the name Devils Tower offensive because it associates their cultural faiths and traditions at the site to devil worship. Which of course it doesn’t. Colorful prayer flags fluttering on trees and ceremonial bundles near the base of the tower are offerings in remembrance of departed loved ones and spiritual renewal. While opponents to the name change usual site economic hardship that could result, since that’s what people have been calling it for over 100 years. In the past, activist groups made numerous proposals and motions to change the name, the most recent efforts occurred in September 2015 with a Wyoming Senator and a Wyoming representative. Both introduced two bills into the 114th session of Congress. Since they haven’t become law under the current session, they cannot be re-reviewed until 90 days into the next session, in April 2017. 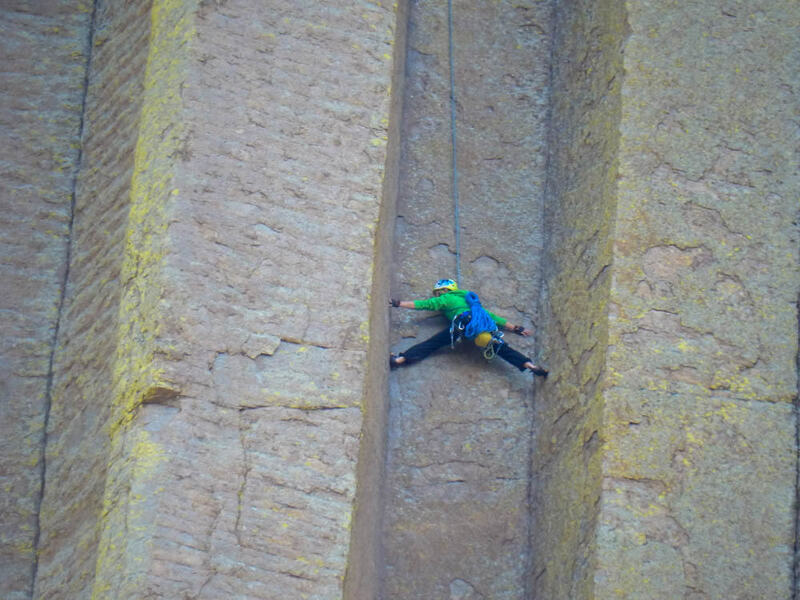 Since the tower is sacred to so many groups, tribal and religious leaders objected to climbers ascending the monument, considering this to be a desecration. The climbers argued that they had a right to climb the Tower since it is on federal land. A compromise was eventually reached with a voluntary climbing ban during the month of June when the tribes are conducting ceremonies around the monument. Climbers are asked, but not required, to stay off the Tower in June. Both climbers and tribals still have subgroups with strongly opposing views but for now, the understanding still holds. The 2006 Climbing Management Plan Update includes the June Voluntary Climbing Closure, which promotes understanding & respect for the culture of American Indian tribes affiliated with the Tower. Regardless of what humans call it, the tower formed over 40.5 million years ago as the earth exuded magma, which then cooled into hexagonal columns of a light to dark-gray or greenish-gray igneous rock with conspicuous crystals of white feldspar, also known as phonolite porphyry by geology geeks. During our visit, Hitch and I walked around the tower on an easy paved trail located near the base. The path mostly wandered through ponderosa pine, but occasionally would come close to the base of the rock field. We read several signs describing geology, ecology, history, and the Tower’s religious significance to the local tribes. Near the northern boundary of the monument, we stopped by a 1.5-mile loop trail that follows Joyner Ridge and dips down into the draw below the ridge. Joyner Ridge Trail provides beautiful views of the Tower, and it surprised me that not many people were walking the trail. Joyner Ridge Trail – Some of the best views of the Tower are found here. In the shadow of this magnificent tower, prairie dog villages thrive. More related to chipmunks and squirrels rather than dogs, the typical Prairie dog sports a small, short tail with eyes and small ears set far back on their heads. Since their light-brown fur blends well with the dirt of their mounds, it’s sometimes hard to spot them except when they move. Sometimes you’ll see a Prairie dog with dark fur, probably because it burrowed into a coal seam. I find them especially adorable and could watch them for hours. Prairie Dogs yip and squeak at the slightest danger. 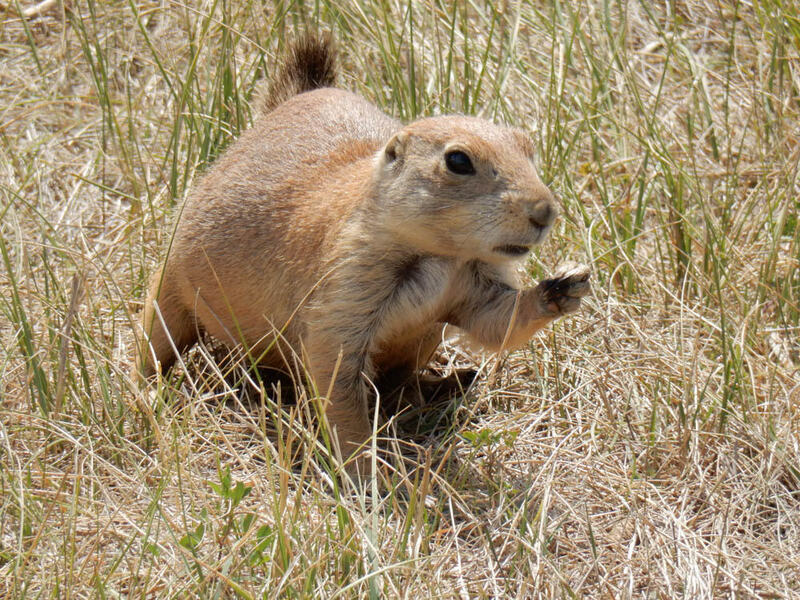 Named for their bark-like warning calls, prairie dogs make several kinds of high-pitched squeaks. each indicating what kind of predator is nearby. The yelps can carry pretty far across the colony; just taking a few steps near a Prairie dog hole will incite a whole series of yips and squeaks that ride across the whole field. Sometimes, I would hear a strange kind of peep, and see two Prairie dogs have a tussle that would roll out into the street. I found myself urging them to run away before they got smooshed by a tourist’s car. If you visit, your sights may be set on seeing the tower, but stop by the nondescript field just within the entrance to the monument. 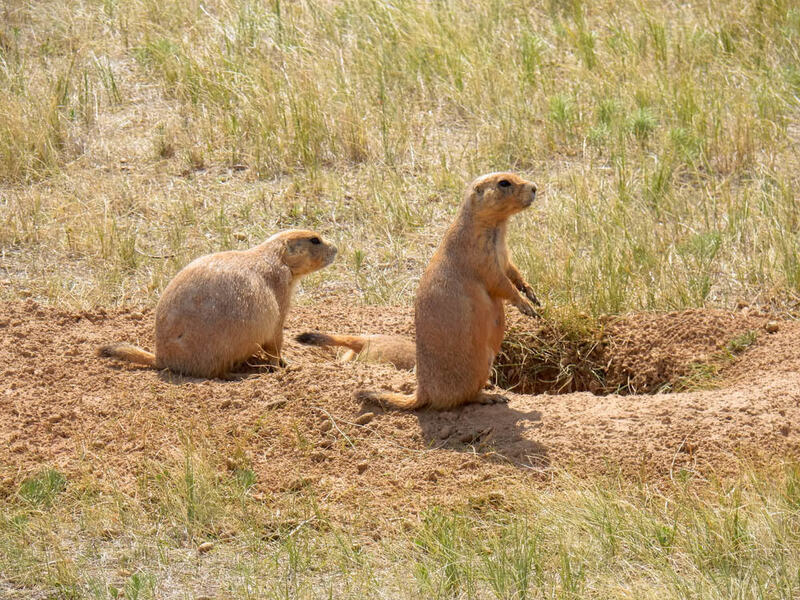 I think almost anyone would enjoy the drama of Days of our Prairie Dogs. Prairie dogs build up large stores of body fat to carry them through the fall and winter months.